In the old days, it seemed like anyone could go anywhere. These days, however, society is not as trusting. With news reports of school shootings, terrorist bombings, and criminals up to no good making headlines daily, it behooves businesses to have access control systems in place for the proper protection of employees, technology and critical business information that’s not meant to be shared. Businesses must be hyper-vigilant about access in this digital world. Access control systems provided by companies like NYCONN Security Systems are designed to keep unwanted people out of certain places. Just like you wouldn’t want to let a total stranger into your home, for fear that he or she could do you harm, a business owner has to be more careful these days about who comes through the doors. Many businesses today have made the transition from using old-fashioned physical keys to “key cards” to open doors. This is a smart idea because old-fashioned keys cannot be tracked, whereas cards can. If one old-fashioned key were to go missing, then all the locks would need to be changed. However, if a key card goes missing, technology allows for an efficient way to deactivate that particular card so an enemy can no longer gain access to the office suites/building. Because cards can be tracked, there’s a database showing who used what when and where– information that gives the powers-that-be a heads-up on what’s going on at their business. 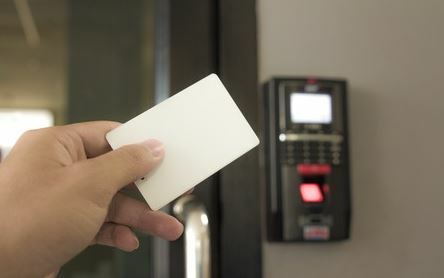 Having modern day access control systems such as key cards helps prevent certain people from going certain places while also enabling other people to go exactly where they need to go when they need to be in certain rooms. Card systems can also help with time clock systems, determining where people were at certain times– including arrivals and departures. Access control systems allow for remote access if and when needed. They can be customizable and not easily copied (unlike old-fashioned keys). Digital records of people’s whereabouts can be kept. And these systems help keep a place more secure, overall. To discuss access control system options, call NYCONN Security Systems serving New York and Connecticut at 1-800-783-5004.